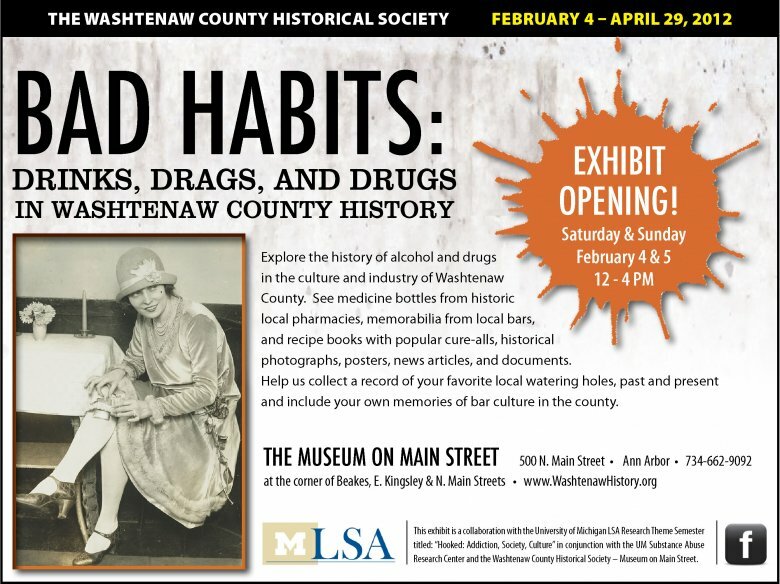 As part of a semester-long series of events related to addiction here at the University of Michigan, a group of students researched and designed an exhibit called “Bad Habits: Drinks, Drags, and Drugs in Washtenaw County History” for a local museum. Co-sponsored by the College of Literature, Science and the Arts and by the University of Michigan Substance Abuse Research Center (UMSARC), the Research Theme Semester, as it is known, has included seminars, visiting speakers, a film series, and more. Those of us involved in the museum exhibit hoped that it would bring the semester’s events into the community and also encourage student involvement with the county historical society, which runs the museum. Like many local historical societies, this one includes a number of older people on the executive board, and I assumed, mistakenly as it turned out, that they might not endorse this idea for an exhibit. In fact, they have been enthusiastic supporters, providing many research leads for the students to explore and, in some cases at least, sharing their own memories of drinking escapades. Since much of the semester has focused on addiction, with a very serious tone as a result, I found their good humor a welcome change of pace.As the students and I, along with a post-doctoral scholar from UM’s History Department who managed much of the project, began thinking about the exhibit, our first challenge was spatial and organizational. The museum, located in a small historic home, has three rooms. How would these spaces structure our story? We decided to assign a substance to each room. This approach meant we lost a sense of chronology and risked leaving visitors with the impression that these substances have isolated trajectories. But it brought a spatial logic that seemed to fit the place—had we chosen a chronological format, we could not guarantee that visitors would go through the rooms “in order.” Furthermore, this method allowed us to highlight local connections, an important consideration since the museum’s mission is to preserve and showcase county history. The students then duly embarked on their research assignments, concentrating respectively on alcohol, drug stores and pharmaceuticals, and cigarettes and marijuana. Research proved fruitful, if frustrating at times, and was a valuable learning experience. One student reflected, “I was really surprised at just how far back the history of drugs and alcohol go, in this county and in the country itself.” Another student appreciated how national issues could be understood in a local context. Once students had identified major themes and events, we looked for artifacts. Some came from the museum’s existing collections, others—such as a wine-making press—were loaned specifically for the exhibit, and still others–like a bar!–were purchased from Craig’s List. Topic areas reflected student interest and local tie-ins, as well as, I am realizing now, a kind of self-censorship that was operating almost unconsciously to keep us “respectable.” As many of us have noted on this blog before, it can be hard to strike an appropriate tone when talking about drugs with students or in any public venue. Staging this exhibit required us to take an interpretive stance, but as we learned, we could not control the way visitors reacted to the exhibit or the conclusions they drew from its text panels, objects, or the fact that it had been done at all. Carry Nation in Ann Arbor. Courtesy of the Bentley Historical Library. The largest room, which visitors generally enter first, focused on alcohol, reflecting its preeminence as a normalized recreational drug and one that looms large in college culture. 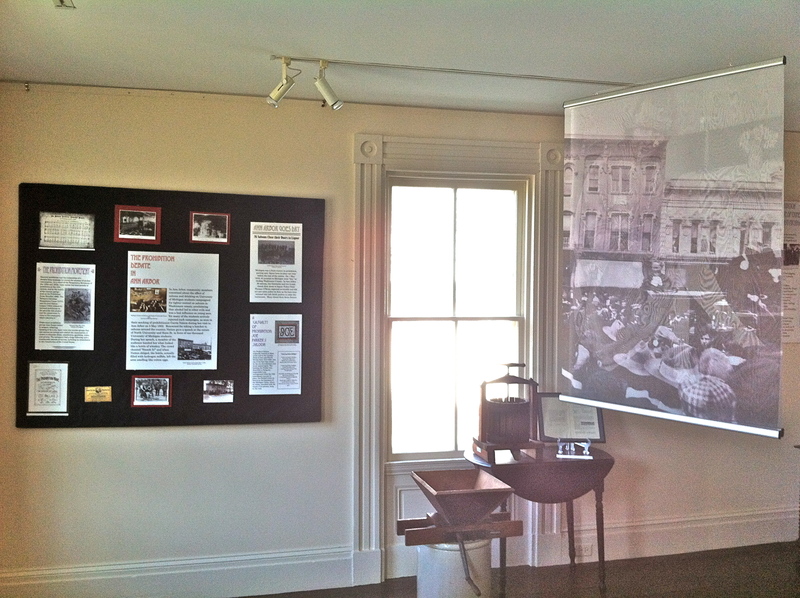 Text panels explained the context of temperance and Prohibition, while photographs and some artifacts emphasized local developments. 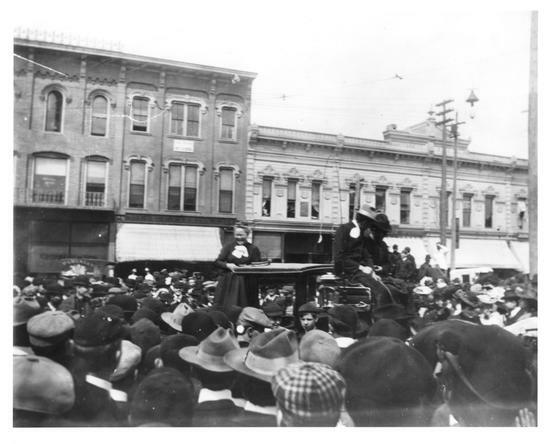 Temperance agitator Carry Nation spoke in Ann Arbor more than a century ago, and a photograph documenting her speech is prominently displayed on a fabric panel that hung from the ceiling. Front room with text panels, wine press, and fabric banner featuring Carry Nation. Other photos highlighted a police raid on a local fraternity that served as the headquarters of a bootlegging operation. We also provided a large map of Ann Arbor upon which we invited visitors to mark their favorite local watering holes. While this is currently done with push pins, students are working on an interactive online version that will complement the wall map and help document the locations of saloons and bars in Ann Arbor and elsewhere in the county over time. The next room centered on the development of pharmaceutical drugs, emphasizing that any division between medical and recreational use is sometimes in the eye of the beholder. 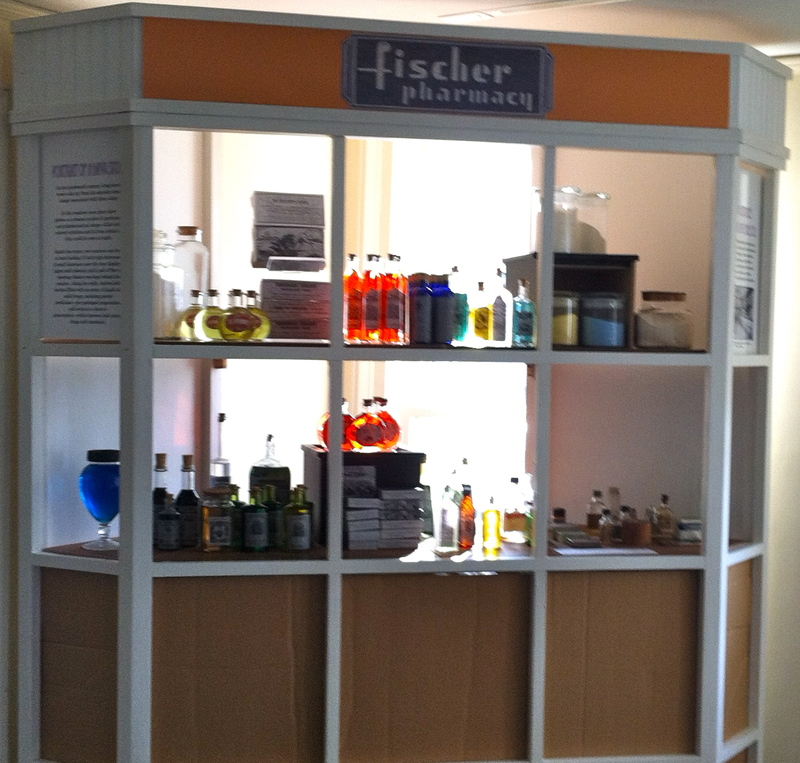 Text panels relayed the early history of drug stores in the county, while a mocked-up storefront suggested a typical establishment of the late nineteenth century. Drug store replica, Museum on Main Street. This topic also allowed us to focus on the role of pharmaceutical companies in the area, particularly Pfizer which had a substantial presence in the county until quite recently. One corner of this room also features an exquisite collection of elegant lighters and ashtrays, which look exotic, even bizarre, to many young adults and kids today. Juxtaposing that collection with signs that triumphantly declare the University of Michigan to be smoke-free illustrates, we hope, the rapid reversal in attitudes toward cigarette smoking. Finally, the back room highlighted the experiences of John Sinclair, a local activist whose drug-related arrests in the 1960s and 1970s helped shape attitudes and regulations regarding drugs, especially marijuana, in Ann Arbor. 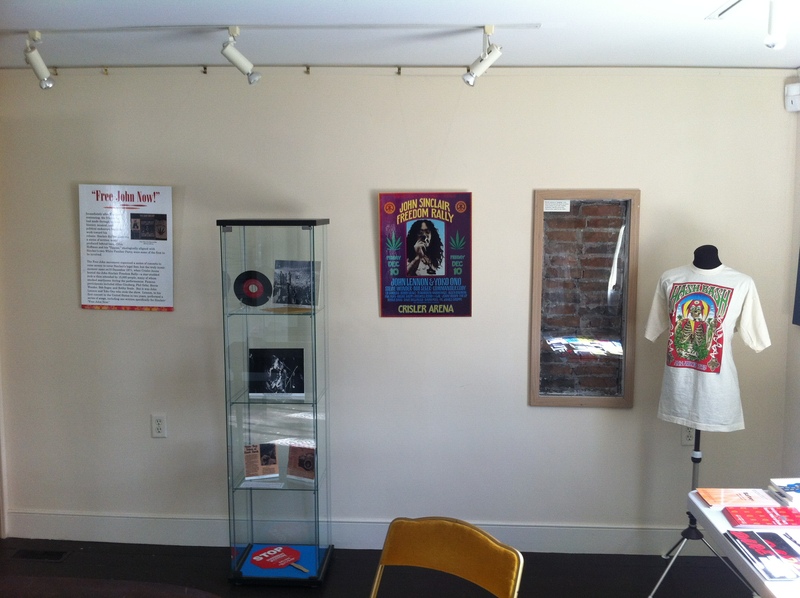 John Sinclair artifacts, Museum on Main Street. Sinclair’s allies organized events and rallies to protest his arrest and raise money for his legal fees, including a huge concert featuring John Lennon and Yoko Ono, along with many other rock icons, at Crisler Arena in 1971. Coupled with the material on Sinclair, we included text panels on the “Just Say No” campaign and the DARE program. Information about Michigan medical marijuana program rounds out the back room, suggesting to visitors that drug-related debates are far from resolved. The process of doing this exhibit has underscored for me how challenging it can be to talk about drugs and alcohol in mixed company, as it were, and how objects, images, spatial relationships, and the implied authority of an institution like a museum can augment or trump the written word. As I edited a text panel on gender and alcohol, for example, I found it almost physically painful to have to compress nuanced ideas that in another context would merit entire books into 150 words. At the same time, I appreciated anew the power of the visual. On the reverse side of the Carrie Nation fabric panel, we hung a photo of a flapper with a flask in her garter (a relatively well-known image from the Library of Congress that we also used on the exhibit flyer, shown at the beginning of the post). When the light is just right, the two images merge. This effect was an unintended consequence of the type of fabric and their proximity, but I wonder now whether it isn’t more persuasive in conveying early twentieth-century transformations in gender roles than any text I can produce, whether short or long. 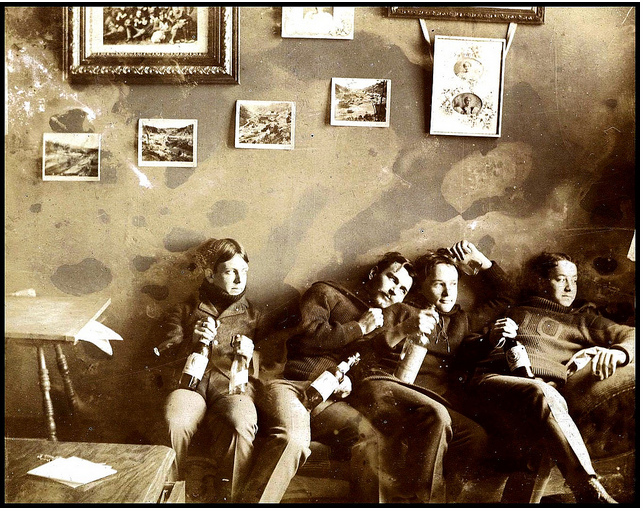 "Plus ca change..." U. Michigan students drinking in fraternity house, 1890. Courtesy of W. Stevens. Sounds like a great exhibit. I understand the University of Michigan has an excellent Museum Studies program. Did you work with them at all? Did conduct, or do you plan to conduct, any visitor evaluations? It would provide valuable insight into how people react to your exhibition’s message and design. Thanks! Yes, in fact the History post-doc to whom I referred in the post completed the graduate certificate in Museum Studies, and one of the undergraduates is a Museum Studies minor who worked on the exhibit as her internship. We have some plan for evaluation but your comment is a good reminder that we need to do more to pursue and then analyze that kind of information.